The accessories provided include a whisker biscuit arrow rest, a pin sight that comes with light and level, and a stabilizer. The peep sight and the loop are already installed. With a 75% let off, it caters to people who cannot draw a heavy bow under normal circumstances. It does not look to be tuned well by the factory. Incidents with the cable guard becoming loose are reported. Amateur archers do better with a complete kit than with purchasing all the needed accessories for their bows from different sources. The RAPTOR Compound Kit comes at the aid of those who don’t have the time to search extensively for the best accessories to fit with their bows. Due to the outstanding quality of the materials used for both the bow and the accessories, this kit is an excellent investment. Seeing how many extras are included, the pricing is competitive and one of the selling points of this kit. Performance is superior, as well, not to mention that the bow is adjustable, and, therefore, versatile. 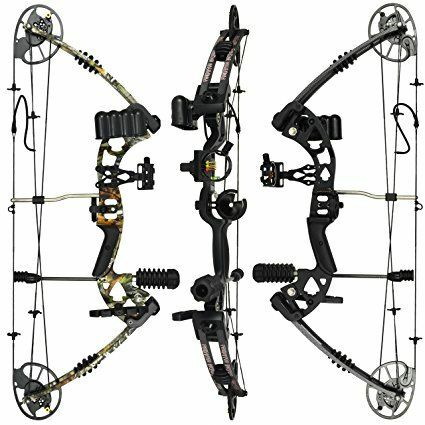 You might expect the limbs of bows within the price range of this model to feel flimsy and cheap, but that is not at all what you will experience when you put your hands on this bow. These components are made in the US, from the highest quality materials possible, which may surprise you, given the price. The fact that the company doesn’t cut corners reflects in the machined aluminum cams, as well. Unlike other models on the market that use plastic for such components, nothing in the cams of this bow contains the said material. The accessories included will offer the same satisfaction. They are also made from top-notch materials, and they add value to a model that is more than decently priced. The 5 pin sight comes with light and level, you also get a whisker biscuit arrow rest and a stabilizer. 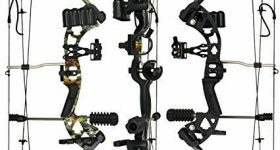 If you add all these accessories to any bow on the market, and compare prices, you will understand why so many people say that the Raptor offers terrific value for the price. The beauty of having a compound bow is the fact that your weapon partially compensates the necessary weight you need to put into drawing the strings. In the case of this particular model, you will discover that 75% of the required weight is let off. What does this mean for you? For instance, if you need to pull 70 lbs, what you’re actually holding when you draw the string is just a total weight of 17.5 lbs. This aspect is one of the many things that make this compound bow such an excellent choice for beginners. The bow is available in solid back and camo pattern, allowing you to choose the one that you feel it is most suitable for your needs. If you intend to use it for hunting, the camo pattern is an excellent choice. For target practice, the solid black color is, probably, often chosen over the camouflage coloring. There are many great things to be said about this particular model, starting with the adjustable draw length and weight. You can modify the draw length of this bow between 24.5” and 31”, as well as the draw weight that can be adjusted between 30 lbs and 70 lbs, and that without having to use a bow press for it. As you can quickly glean from this information, the Raptor is an excellent choice for anyone who seeks versatility. The 30” axle-to-axle design and the total weight of just 3.6 pounds contribute to the popularity of this bow among novice shooters and archers. When using 350-grain arrows, you will be able to send them flying at a velocity of 315 feet per second, which is an achievement for bows in this class. Besides the cool accessories that you will get right out the box, the peep sight comes already installed, which means that no extra assembly is required. The tuning system is a split yoke model, and it allows you to adjust your bow as you see fit. Many people are interested in taking up archery, but they are unsure whether they will settle for target practice or they will want to take the bow with them when hunting or even fishing. The manufacturer advertises this kit as being ideal for any activities that require a bow, even bow fishing. Ideal for practicing and honing your aim and precision, it is an excellent choice for novices. However, even adults who never used a bow can take advantage of the versatile construction and outstanding performance of this model. The fact that it only takes minutes to adjust the bow for archers of different skills and body frame is another great plus that counts toward the incredible versatility of the Raptor. If you are a beginner archer and you don’t know what you should purchase as your first bow, this kit answers all your questions. It comes with everything that’s needed to increase your precision, and it also caters to your comfort. The only accessory not supplied is a quiver with arrows, so you will have to get those separately. Otherwise, it has an arrow rest, a pin sight, and a stabilizer, so everything you might need to start practicing. Easy to adjust for people with different skills and heights, it is a versatile option you should not overlook.